To my shame, since my last dishrag posting, I have gone insane and have knit dishrags uncontrollably. I manged to stop at eight. Now sit back and relax while I insanely review dishrag results. You will recall that this craze was started on its unfortunate course by (what else?) a Learn to Knit Afghan square called Twisted Columns featuring twisted stitches in two colors. I was pleased with the two dishcloths that resulted. The twisted columns stood up well to use, not becoming too raggy when wet, and I loved the dark brown and acid green color combination I used. By the way, all of these dish cloths were made with small quantities of worsted weight cotton yarn I had standing around for who knows what reason. The twisted columns are on the left. 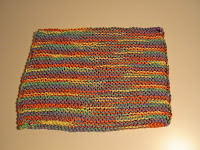 Noticing that I had a very small quantity of colorful variegated cotton, I went on to make two garter stitch squares. They are OK, hardly worth mentioning, but hey, they're dishrags. 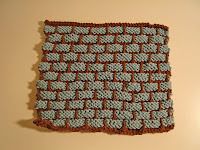 Hungry for more dishrag fodder, I turned to Ravelry and discovered Grandma's Favorite. This is one of those diagonal designs that I find endlessly fascinating, not being mathematically inclined enough to invent them for myself. You start with four stitches and increase with yarnovers at each edge until you reach the middle, 46 or 48 stitches. Then you decrease back to four stitches and bind off. You have made a square with a lacy little border. I made two, one out of a pretty but dated southwest style variegated colorway and one out of the leftover variegated pictured above and some of the acid green. That one made a solid with a colorful stripe placed off center. The southwest Grandma's Favorite is the top rag pictured below. Grandma's Favorite was the most fun to make, but it has the least body and turns too raggy when wet. Never mind because, hey, it's a dishrag. This brings me to the dishcloth pictured above underneath Grandma's - that Queen of dishrags - the Ballband Dishcloth. Although touted by the Mason Dixon girls, I never thought it attractive enough or believed it to be good enough to bother with. Boy is my face red. It's great. It stays spongy when wet, and, because of it's functionality, it has started to look beautiful to me. at right is another version in my favorite solid blue and dark brown. I do have a slight caveat regarding this dishcloth. It features slipped stitches, and as I have learned from working with Barbara Walker's Learn to Knit Afghan book, I don't like slipped stitches that lay across a lot of rows - four in this case. I think they're slovenly. So, prompted by a fellow Raveler, I slipped the stitches knitwise instead of purlwise as instructed. This twists the stitches so that they lay closer to the fabric underneath and are altogether tighter and neater. Now that I have discovered the Ballband I can't promise that I won't knit more of them. But I'll try not to post about it again. Mighty cute dishrags. And if you want to find more ways to use squares -- well . . . two worsted weight squares sewn or crocheted together make a dandy hotpad. I have several (that I still use), created during a mania-for-squares phase. Oh, I'll bet you won't stop there. Just wait 'til you try a knitted dish towel. They are so superior to any towel you could buy. (I rave about mine.) All you have to do is knit a larger dishrag and you've got a towel.